Published on May 24, 2010 in Elections, Gender, General T&T, NJAC, People's Partnership, PNM, Politics, UNC and Videos. 162 Comments Tags: Jack Warner, Kamla Persad-Bissessar, Politics, T&T Govt. 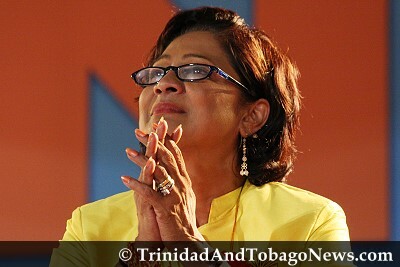 The latest tally is 29 seats to the People’s Partnership and 12 seats to the PNM. The People’s National Movement has officially lost the Election. The Political Leader Patrick Manning has conceded defeat to the People’s Partnership. Published on May 24, 2010 in COP, Elections, General T&T, NJAC, Open Thread, People's Partnership, Photos, PNM, Politics and UNC. 18 Comments Tags: Jack Warner, Kamla Persad-Bissessar, Patrick Manning, Politics, T&T Govt. Voters lined up from as early as 5:30 AM at a polling station in Maraval. 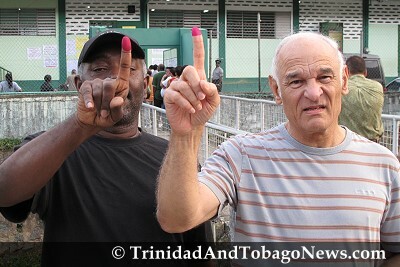 Here two of the early voters showed off their stained fingers at 6:15 AM.